When it comes to rare gold coins versus common gold bullion coins, what are the pros and cons of each one? Many investors will start a gold coins investment without understanding what each type offers, and the downfalls and disadvantages that each type may have. Standard bullion coins are not normally rare, although they can be very valuable depending on the current spot price of the precious metals. These coins are very liquid which means these are easily bought and sold, and you may make some profit off the transaction but you will not normally see an extravagant return from these investments. Pros: The value of the bullion coins is derived exclusively from the metal content, therefore it carries significantly lower dealer mark ups and presents a cost savvy addition to your precious metals portfolio. It is also an excellent hedge against inflation thus preserving your hard earned dollars. Cons: Bullion prices follow the spot price of the metal which is rather volatile and moves against the market conditions. In favorable economic times, bullion easily loses its value which may stay low for years until market conditions change. Rare coins have additional factors included in their price calculations that depend on mintage year, coins’ grade and various other specifications that are completely irrelevant for bullion products. Pros: Rare gold coins can multiply quickly in value because they are in high demand and the supply is very low. Cons: These normally are very overpriced to include various charges and mark ups to account for their rarity and grade points beyond the value of the actual metal. The value is unpredictable and is dependent on numismatic market supply and demand which can go either way. There are many types and choices with both standard and rare gold coins, but there is a difference in the liquidity of these two coin types. 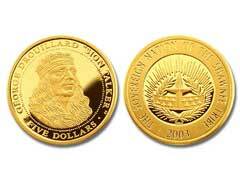 While standard gold bullion coins are easily sold in most cases, coins which are rare may be harder to sell. If you have a Henry VIII coin in great condition and with a very high value, you may have to wait until an interested buyer comes along. Sometimes rare and historic choices, like very old British coins of gold, can be worth an astounding amount, and most investors do not have this amount of capital available. For certain rare gold coins an auction may be required just to sell the investment because of the high demand and rarity of the coins involved. Some older Russian gold coins may also have a numismatic value as well as the bullion value. With some of these investment choices the quality or quantity of the gold is insignificant, and investors want the coins because of their value in history instead. For most investors, rare gold coins should be avoided and bullion coins should be used instead for investment purposes. With all of the available bullion coins, like American Eagles and gold Vienna Philharmonics, you do not have to choose rare coins unless you want them as a collector. As an investment, rare coins can be somewhat risky.